Many people experience back problems, knee and shoulder pain, poor circulation and general fatigue as a result of sitting incorrectly for long periods of time. The Salli range of saddle chairs offers an alternative, more comfortable and healthier way to work. With its divided saddle seat (patented worldwide), Salli saddle chairs are an intelligent and revolutionary ergonomic solution to seating, improving posture, circulation and productivity. The Salli range is made in Finland to the highest Scandinavian standards. The Salli saddle chair tilts the hips forward, allowing the lower back and upper body to find a relaxed, natural posture without needing a backrest. The sitting bones are well supported which keeps pressure off the buttocks and thighs. The feet are placed firmly on the floor making it very easy to manoeuvre the chair. The gap in the centre of the seat increases ventilation to the pelvic region and prevents harmful pressure on sensitive tissues. Train your core muscles during the work day with a Salli Swing. The swing mechanism of Salli Swing enables the seat to be tilted in all directions without the need for a separate adjustment lever. Thus you can exercise while sitting, which improves the mobility and metabolism of the lower back, and activates the whole body. The two-part active seat has a hand controlled height adjustment with gas spring. Salli Swing has a 10 year warranty. Salli Twin is excellent all-round saddle chair, without inclination, for both men and women. The divided two-part seat is made with high-quality leather, with 16 colours to choose from. It has a hand-controlled height adjuster with gas spring and comes with a 10 year warranty. Salli Twin with inclination has all the benefits of the Salli Twin, with an additional inclination mechanism to set the hips at the correct and most comfortable position. 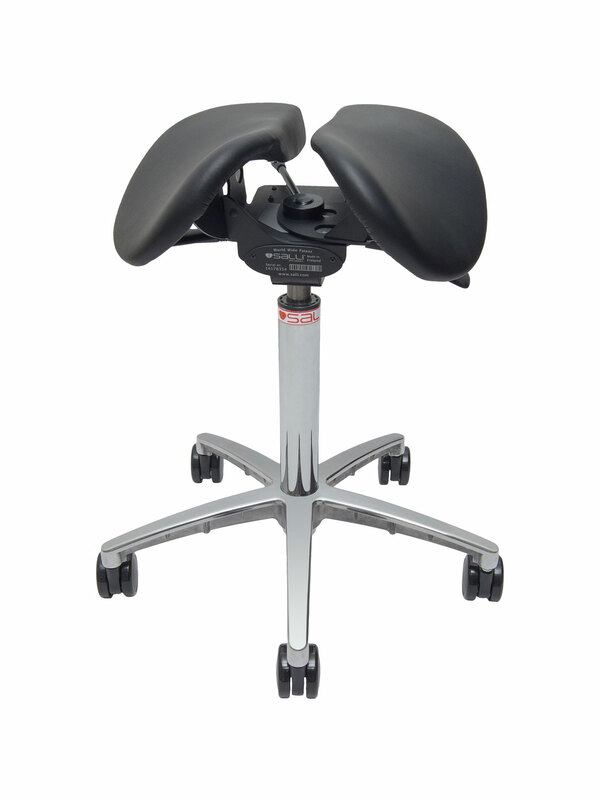 It’s an excellent all-round saddle chair for men and women. The divided two-part seat is made with high quality leather. The Salli Twin comes with a 10 year warranty.